Doing a bit of winter work to the truck before the real restoration starts, first up a valve job reset the timing and going through the fuel system. So more about this cckw, it left the US forces and went to Belgium going by the new data plates. At some point someone has removed what body it had and fitted a flatbed with a crane, not great for the original look but quite functional for me as I carry my M29c on the back. It has had a load of work done to so far to start to bring it back to A. Running order and B. As stock as I can get it. I have replaced the fuel line (had plastic hose fitted not flexi pipes) and this was drawing air, removed the electronic ignition and went back to points/condenser. 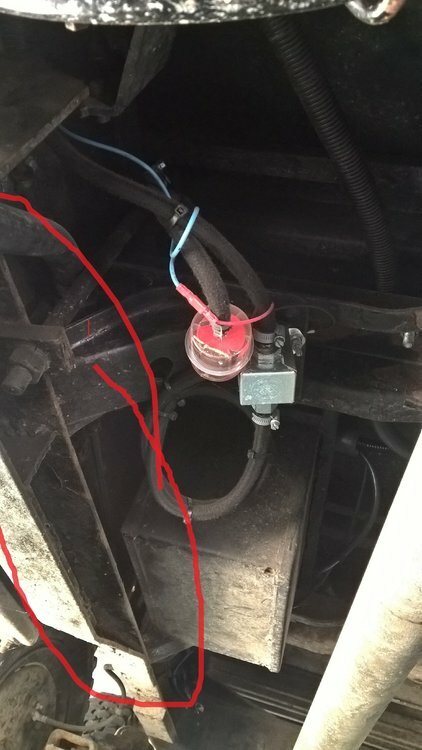 The truck had a running issue where it would pop and fart back through the carb under load, previous owner had fitted a Chevy carb which was too small and tried to feed the engine by winding everything out to the max, this made the truck tick over but didn’t run on load. so I picked up a good second hand carb and then got a gasket set plus other bits (correct air filter, oil filters and other service parts) from Rex Ward (top guy) and now the truck runs good. So here is the truck with the wrong rear body (but I like it) as I can carry my 45 M29c weasel on the back. One modification I have made is to shorten the rear bed, as you can see in the photo the beaver tail section over hanged the rear by a good 2ft. This meant that I could not get to the tow hook or see the rear bumper guards. anyway a quick chop I removed some of the rear bed, repositioned the rear lights to under the bed and put a section of angle over the top to clean up the rear. The truck is registered as a flat bed so there is no issue with carrying stuff, the truck is also plated upto 9500kilos but weighs less then a standard 353. 976 UXH is on the system as being MoT exempt. It also has no recorded revenue weight or wheelplan. The type of body fitted is totally irrelevant, until the vehicle is plated , tested and registered as a goods vehicle it is illegal to carry a load unless that load is a fixed part of the vehicle, End of story. Thanks for the info, I guess you all know the truck better then me and what my license/insurance is. Thanks for the relays and concerns but I’m ok with carrying my weasel or jeep on the back and I know it’s legal and there is no issue. This has nothing to do with your license or insurance, and we may not know your particular truck but we do know the law as it relates to what you are doing. An untested truck cannot be used laden. A vehicle taxed as historic cannot be used laden. Is it tested? Is it taxed PHG? Remember the small print says your insurance is only valid if the vehicle is being used legally. As I have said before I happy my vehicle meets the legal requirements when I am using it, now you can think and assume what you like but it has nothing to do with you. This thread read is about my Jimmy and I’d thank you for keeping you irrelevant comments off it. I agree it is a useful forum, but people assuming information and posting replies based on that is not helpful, especially when they don’t like the honest replies given to their misguided comments. I know the vehicle is legal and I know I won’t have an issue when I use it. since owning this vehicle it is now more road legal then it has ever been, with correct lights, working brakes. The internet can be good fun and people should learn to relax and not pass judgment on threads when they don’t know the full facts, I have over 20 years of restoration, coach building and transportation knowledge with careers in the military and government (department of transport) so I am happy with how I am using/running the vehicle. A) - The driver if and when they fall foul of the law and the ramifications of in effect driving a vehicle without valid insurance - as rightly stated - driving a vehicle that is not registered or plated to carry loads is an offence and as such would make any insurance null and void - thus giving the authorities the power to seize and crush the vehicle if they wish - and they very often do..
C) - The rest of the Military and Classic vehicle community who will then be under the spotlight once again for all the wrong reasons. Our hobby is facing enough pressure from the Government and DVLA as it is without the question of individuals flouting the law knowingly or vehicles being used inappropriately . - That aside - I love the truck, its both unusual and I think a good looking conversion and (if you lost the hiab in my personal opinion) could easily pass for a wartime modification. I always enjoy restoration pictures as does everyone im sure and thank you for sharing them. I think the modifications to the rear beavertail enhance it and make it both safer and more in keeping with the wartime look. I've also seen GMC's Cargo's carrying jeeps in the rear - so unfortunately this is by no means a lone example - but given all the advice and warnings - I can only hope that the owner/driver re-think the plan to carry the weasel as a load until the vehicle is plated and registered / legally allowed to do so - whilst I appreciate the original post and its direction may have been over-taken by the comments regarding the carrying of the weasel and the legal requirements - please take them as advice and not as personal attacks or insults - the comments/warnings and solutions are offered in good faith by genuine people who know what they are talking about and are offered to help you enjoy your vehicle and the hobby whilst staying both stay safe and legal. I would ask if you are so convinced you are legally entitled to carry such loads - what you have done to achieve this so that other members with similar vehicles can then do so that they may also carry such loads, it would be very good for others using this forum who could then benefit from your wisdom and actions. The Crane is a fixed part of the rear bed, a original part of it so it cannot be removed. It is also very old with hand cranks not a modern crane at all. I am not sure what body was original on it but I will be removing the rear flat bed to install better bushes and more heavy duty U bolts to hold it all together. Its easy enough to identify if it was a workshop - there were two additional strengthening strips attached to the chassis rails as early testing of the Workshops with a load resulted in the chassis bending just behind the cab mounts....where is the spare wheel located? - if its on the opposite side to the fuel tank / forward position under the chassis and is in a drop down cradle then it would also point towards a workshop variant as the cab and chassis were unique and different to any of the other GMC CCKW variants. No sadly no extra bracing under the chassis rail, looks like the fuel tank is used so the body clears in that area.